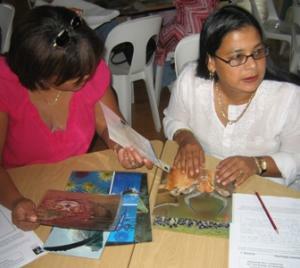 Interactive capacity development workshops are offered to educators, educators in-training and education officials. What is biodiversity and what are the levels of biodiversity in South Africa? What is the current status of biodiversity globally and in South Africa, and what are the threats and pressures to biodiversity? What have the responses to this loss of biodiversity been both internationally and nationally? What should the continued responses be and how can we as individuals and communities assist? The participants then investigate where the topic of biodiversity is located within the National Curriculum Statement and are assisted to develop lessons based on the biodiversity of their local context. If the workshop is based at the Kirstenbosch NBG, the participants are taken into the Garden and shown various teaching and learning activities based on the topic. Workshop participants play the sustainability game and then develop their own definition of sustainability. A discussion about the history of the term ‘sustainable development’ leads to an understanding of the current four dominant perspectives of this topic. They are shown graphs of the current ‘ecological footprints’ of the various countries of the world which illustrate the disproportionate resource usage globally. An article illustrating the production of a cotton T-shirt is used as the focus of an activity which interrogates the idea that modern production processes of everyday items use and waste large amounts of resources. Using a newspaper article which describes the tension between the need for housing development and the need to conserve the critically endangered vegetation type on a particular site, the participants develop and act out a role-play thus illustrating the various viewpoints within this issue. Various activities (a picture-building activity, viewing a screening of the film “An Inconvenient Truth” and a Power Point presentation) are used to assist participants to develop an understanding of the concepts. This is followed by an activity which allows the participants to understand how closely lives and livelihoods depend upon a predicable climate. The current climate change predictions for South Africa forms the basis for an activity in which the participants investigate the predicted effects of climate change on agriculture, biomes, spread of diseases, etc. in South Africa. Finally, both mitigation and adaptation solutions are brainstormed and discussed in the light of the National Climate Change Response White Paper. This framework is ideal for the development and implementation of environmental action projects in a local context. Workshop participants are introduced to the framework via a Power Point presentation. They then use newspaper articles illustrating various environmental issues together with the active learning framework as a basis for developing theoretical environmental action projects which are shared with the group. They are then required to start the development of an environmental action project for their own school context. These are facilitated in response to specific requests from different educational organisations. 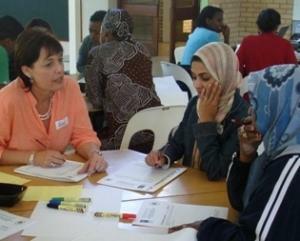 Some examples of these workshops are Resource Development, Science Process Skills, Science and Maths in Early Learning Childhood Development and Environmental Education Activities for In-Training Educators. This programme is composed of a network of diverse partners who all work with teacher education in a variety of ways to improve environmental learning in schools. 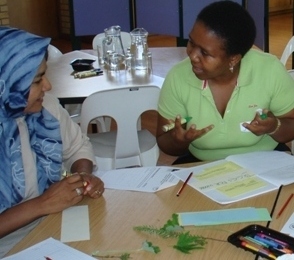 The staff members of the Kirstenbosch Biodiversity Education and Empowerment Centre form part of the Western Cape Fundisa for Change cluster and assist in the facilitation of in-service teacher training courses – these being accredited through the University of Cape Town.